From June 1, only motorhomes and caravans that have an inside toilet that can be used even with the bed made up will be issued a Certified Self-Containment (CSC) documentation. The new amendments to Standard NZS 5465:2001 raise the bar for freedom campers in New Zealand. Vehicles that aren’t equipped with the required facilities will no longer qualify as CSC. "That’s going to be good news for councils and communities who have been telling us that this has been the single most concerning issue around freedom camping," NZMCA CEO, Bruce Lochore, says. "It’s also terrific news for our industry and is a great example of what we can achieve working together. "It was great to see we were all on the same page, looking after each other’s interests and working together to protect the ‘golden goose’ that is the privilege of freedom camping. This has been a huge step forward for the collective approach of the entire industry." The review of the Standard received a $47,000 fund from NZMCA, a decision that Bruce says was made because, "communities have made it clear that they welcome responsible freedom campers in suitably self-contained vehicles". He adds that the consistent message received from different communities in New Zealand that is freedom camping in non-self-contained vehicles is not acceptable. "This is our industry’s way of maintaining the credibility of the Standard so that communities can have the comfort of knowing that if a vehicle is CSC, the occupants will be truly able to contain their waste and not simply dump their waste in a way that damages the environment," Bruce says. 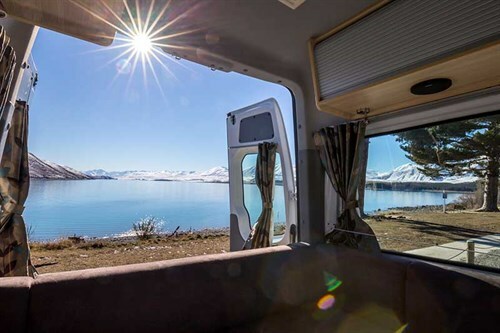 He adds that motorhoming and caravanning is a fast-growing leisure activity in New Zealand and, while seeking the Standard’s review, the 73,000-member association were careful that new amendments to the Standard won’t prevent Kiwi families from enjoying motorhoming. "However, we also needed to put the problem in perspective. And when you take the time to have a look at where the problem is coming from, it’s clearly from the tiny minority of freedom campers in non-self-contained vehicles and the obvious concerns this raises around hygiene and sanitation. That’s the bugbear for councils and communities all around the country," Bruce says. Apart from receiving funding from the NZMCA, the review also received a strong support from the industry. "The mainstream motorhome manufacturers and distributors all focus their sales on self-contained vehicles and the motorhome rental industry is predominantly CSC too. "These three segments of the industry are all doing the right thing; so it’s not unreasonable to put controls in place for the problem area – travellers in non-CSC vehicles. "If councils choose to create facilities to cater for this segment of the market, that’s one thing; but if travellers don’t have Certified Self Containment on board they shouldn’t be freedom camping—it’s as simple as that." Although the key aspect of the amendment is the requirement of useable toilets, other revisions focus on providing a reasonable period for non-complying vehicles to transition to the new level and a change to how many testing officers are required to do initial vehicle checks. In the past, it used to be two officers. Now if the SCO has done more than 20 checks, it’s just one. Vehicles certified after 31 May 2017 will need to meet all aspects of the amendments to be certified for four years. Vehicles that only meet amendment one will still be able to be certified after 31 May, however, this will only be valid until 31 January 2018. After this date, all vehicles must meet amendment one and two to get certification. Amendments to the Standard can be freely downloaded on the Standards New Zealand website. A full version can be purchased from Standards NZ.